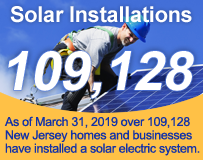 You don’t have to look far in New Jersey to see one of the thousands of solar electric systems providing clean power to homes, businesses, schools and government buildings. They’re practically everywhere! The question you may be asking, though, is whether solar is the right choice for you. This section of our website is intended to help you answer that question by providing information on how solar works, what benefits it offers and the options that homeowners and business owners have in installing solar electric systems on their homes or businesses. You might also find this Consumer Reports article from June 2016 helpful as well. If you don’t find everything you’re looking for in this section, you can also visit our Frequently Asked Questions page. For detailed technical information for designing and installing a system, please consult an experienced solar electric system supplier or installation contractor. Solar energy refers to electric or thermal energy produced from the light or heat of the sun. There are several types of solar technologies; however, this section focuses only on photovoltaic (PV for short) systems, which convert sunlight into electricity. PV systems produce electricity when sunlight strikes solar cells made of silicon or other semiconductor materials that are enclosed in a solar panel. This causes the cells to release electrons that are captured in the form of current. The type of current produced by a PV system is Direct Current (DC), which must be converted to Alternating Current (AC) by a device called an inverter. AC is the form of electricity supplied by your local electric utility and is used to operate appliances, lights and other electrical equipment in your home or business. In addition to converting electric current from DC to AC, the inverter also connects your solar system to your local electric utility. This interconnection is important, because you will continue to rely on your utility to provide you with electricity at times when your solar system is not producing enough power to meet your needs (i.e., at night or on rainy days). The interconnection is also important because there may be times when your solar system produces more electricity than your home or business needs. At those times, the excess power is sold back to your utility. We’ll discuss this concept in detail later when we talk about Net Metering.